The Great Wall of China, a massive fortification structure that became the monument of Chinese civilization. 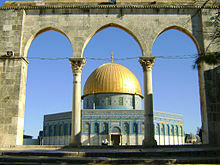 The Dome of the Rock, a shrine on the Temple Mount in the Old City of Jerusalem, covering the Foundation Stone which bears great significance for Jews, Christians and Muslims. 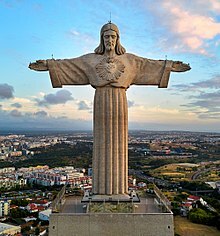 The Christ the King, in Almada, Portugal, has become one of the most visited national monuments. The origin of the word "monument" comes from the Greek mnemosynon and the Latin moneo, monere, which means 'to remind', 'to advise' or 'to warn', suggesting a monument allows us to see the past thus helping us visualize what is to come in the future. In English the word "monumental" is often used in reference to something of extraordinary size and power, as in monumental sculpture, but also to mean simply anything made to commemorate the dead, as a funerary monument or other example of funerary art. Basically, the definition framework of the term monument depends on the current historical frame conditions. Aspects of the Culture of Remembrance and cultural memory are also linked to it, as well as questions about the concepts of public sphere and durability (of the one memorized) and the form and content of the monument (work-like monument). From an art historical point of view, the dichotomy of content and form opens up the problem of the “linguistic ability” of the monument. It becomes clear that language is an eminent part of a monument and it is often represented in “non-objective” or “architectural monuments”, at least with a plaque. In this connection, the debate touches on the social mechanisms that combine with Remembrance. These are acceptance of the monument as an object, the conveyed contents and the impact of these contents. Monuments are also often designed to convey historical or political information, and they can thus develop an active socio-political potency. They can be used to reinforce the primacy of contemporary political power, such as the column of Trajan or the numerous statues of Lenin in the Soviet Union. They can be used to educate the populace about important events or figures from the past, such as in the renaming of the old General Post Office Building in New York City to the James A. Farley Building (James Farley Post Office), after former Postmaster General James Farley. To fulfill its informative and educative functions a monument needs to be open to the public, which means that its spatial dimension as well as its content can be experienced by the public, and be sustainable. The former may be achieved either by situating the monument in public space or by a public discussion about the it and its meaning, the latter by the materiality of the monument or if its content immediately becomes part of the collective or cultural memory. The social meanings of monuments are rarely fixed and certain and are frequently 'contested' by different social groups. As an example: whilst the former East German socialist state may have seen the Berlin Wall as a means of 'protection' from the ideological impurity of the west, dissidents and others would often argue that it was symbolic of the inherent repression and paranoia of that state. This contention of meaning is a central theme of modern 'post processual' archaeological discourse. The term is often used to describe any structure that is a significant and legally protected historic work, and many countries have equivalents of what is called in United Kingdom legislation a Scheduled Monument, which often include relatively recent buildings constructed for residential or industrial purposes, with no thought at the time that they would come to be regarded as "monuments". Until recently, it was customary for archaeologists to study large monuments and pay less attention to the everyday lives of the societies that created them. New ideas about what constitutes the archaeological record have revealed that certain legislative and theoretical approaches to the subject are too focused on earlier definitions of monuments. An example has been the United Kingdom's Scheduled Ancient Monument laws. 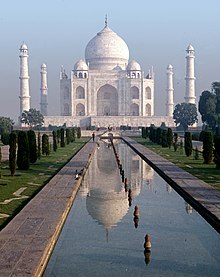 Other than municipal or national government that protecting the monuments in their jurisdiction, there are institutions dedicated on the efforts to protect and preserve monuments that considered to possess special natural or cultural significance for the world, such as UNESCO's World Heritage Site programme and World Monuments Fund. Recently, more and more monuments are being preserved digitally (in 3D models) through organisations as CyArk. Benchmarks placed by a government agency or private survey firm. Buildings designed as landmarks, usually built with an extraordinary feature, such being designed as the tallest, largest, or most distinctive design, e.g., the Burj Khalifa in Dubai, the world's tallest structure. Cenotaphs (intended to honor the dead who are buried elsewhere) and other memorials to commemorate the dead, usually war casualties, e.g., India Gate and Vimy Ridge Memorial, or disaster casualties, such as the Titanic Memorial, Belfast. Church monuments to commemorate the faithful dead, located above or near their grave, often featuring an effigy, e.g., St. Peter's Basilica or the medieval church Sta Maria di Collemaggio in L'Aquila. Columns, often topped with a statue, e.g., Berlin Victory Column, Nelson's Column in London, and Trajan's Column in Rome. Eternal flames that are kept burning continuously, usually lit to honor unknown soldiers, e.g., at the Tomb of Unknown Soldier in Moscow or at the John F. Kennedy gravesite in Virginia's Arlington National Cemetery. Fountains, water-pouring structures usually placed in formal gardens or town squares, e.g., Fontaines de la Concorde and Gardens of Versailles. Gravestones, small monuments to the deceased, placed at their gravesites, e.g., the tombs and vaults of veterans in Les Invalides and Srebrenica Genocide Memorial. Mausoleums and tombs to honor the dead, e.g., the Great Pyramid of Giza, Libyco-Punic Mausoleum of Dougga and Taj Mahal. Monoliths erected for religious or commemorative purposes, e.g., Stonehenge. Mosque Monuments, places of worship that generally have domes and minarets that stand out against the skyline. They also usually feature highly skilled Islamic calligraphy and geometric artwork, e.g., the Mosque of the Prophet. Mounds erected to commemorate great leaders or events, e.g., Kościuszko Mound. Obelisks, usually erected to commemorate great leaders, e.g., Cleopatra's Needle in London, the National Monument ("Monas") in Central Jakarta, and the Washington Monument in Washington, D.C.
Palaces, imposing royal residences designed to impress people with their grandeur and greatness, e.g., Forbidden City in Beijing, Palace of Versailles, and Schwerin Palace in Schwerin. Searchlights to project a powerful beam of light, e.g., Tribute in Light in the National September 11 Memorial & Museum in New York City, commemorating the September 11 attacks of 2001. Statues of famous individuals or symbols, e.g., the Niederwalddenkmal (Germania) in Hesse, Liberty Enlightening the World (commonly known as the Statue of Liberty) in New York City, and The Motherland Calls in Volgograd. Temples or religious structures built for pilgrimage, ritual or commemorative purposes, e.g., Borobudur in Magelang and Kaaba in Mecca. Terminating vistas, layout design for urban monuments on the end of an avenue, e.g., Opera Garnier in Paris. Triumphal arches, almost always to commemorate military successes, e.g., the Arch of Constantine in Rome and Arc de Triomphe de l'Étoile in Paris. War memorials, e.g., the Iwo Jima Memorial in Arlington, VA, the Laboe Naval Memorial, the Lorraine American Cemetery and Memorial in St Avold, and the Soviet War Memorial in Berlin. ^ a b "Preserving Cultural Heritages". wmf.org. World Monument Fund. Retrieved 2013-10-23. ^ "Monument - definition of". thefreedictionary.com. The Free Dictionary by Farlex. Retrieved 2013-10-23. ^ John Young Cole; Henry Hope Reed (1997). The Library of Congress: The Art and Architecture of the Thomas Jefferson Building. Norton. p. 16. ISBN 978-0-393-04563-5. ^ "Lorraine American Cemetery and Memorial". abmc.gov. Choay, Françoise (2001). The invention of the historic monument. Cambridge University Press. Gangopadhyay, Subinoy (2002). 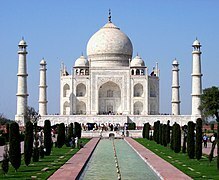 Testimony of Stone : Monuments of India. Dasgupta & Co.
Phillips, Cynthia; Priwer, Shana (2008). Ancient Monuments. M E Sharpe Reference. Stierlin, Henri (2005). Great monuments of the ancient world. Thames & Hudson. Wikimedia Commons has media related to Monuments and memorials in unidentified countries. Look up monument in Wiktionary, the free dictionary.